The first Native American appointed to the Arizona Board of Regents said she’s honored to serve on the board, but it comes with a great challenge. “It’s being a part of history, but it’s also a great responsibility to represent not only Native Americans but also rural Arizona,” said LuAnn Leonard, a member of the Hopi Tribe. The Indian Legal Program at the Sandra Day O’Connor College of Law hosted a reception Wednesday to honor Leonard, who joined the board in March. Gov. Janet Napolitano chose to nominate Leonard in a push to find experienced leaders in education from counties with fewer than 800,000 people, Leonard said. “When I got the call from the governor’s office … I knew that if I didn’t try and say yes to going forward with the nomination that we might miss an opportunity for Native Americans,” she said. 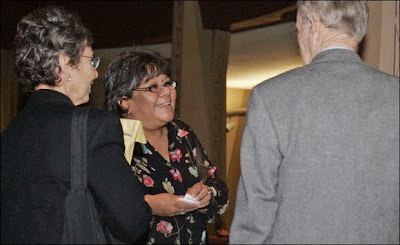 Zah said Leonard would be able to show her experience at the ABOR meeting Thursday, when regents are set to vote on a tribal consultation policy would require each university to designate tribal liaisons and submit annual reports regarding relations with Native American tribes. “Regent Leonard would be able to bring the regents’ attention to that [relationship],” he said. Leonard said she is looking forward to being a part of shaping the future of the university system at Thursday’s ABOR meeting, but she would not comment on how she will vote on the tuition proposals. To conclude the ceremony, members of the Indian Legal Program gave Leonard an ASU stationery set. Leonard said anyone attending the ASU-UA football game can expect to see her showing it off. “I’ll be flashing the ASU pen,” she said. Reach the reporter at adam.sneed@asu.edu.